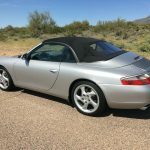 1999 Porsche 911 C2 Cabriolet- When you read the below description please understand I am very picky. Most people would consider the car excellent. I would rather nit pick it, and let the buyer be pleasantly surprised when the see it. Very nice low mileage California car. I will document the condition in the car in detail below. I have driven it extensively. The Ac works excellent. 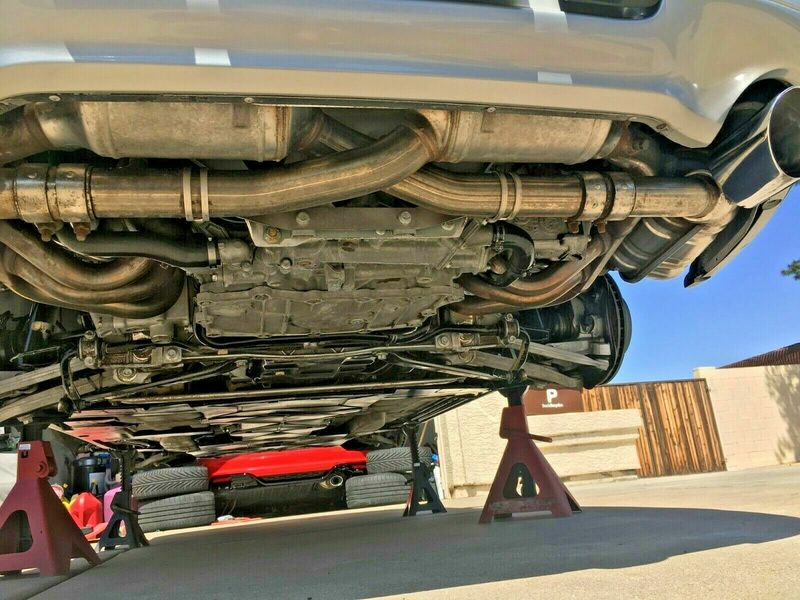 I have just completed an oil change. The suspension is tight. The top works well. The Carfax shows an accident from 2005. I see no evidence of panel replacement. The front, and back bumpers have been re-painted as some point, but it has been a while. I am happy to email you the CarFax. Send me a message with your email address. The car is equipped from the factory with the below options. I have the build sheet if anyone wants to see it. Body: The original Arctic Silver Metallic paint is in very good condition. as previously mentioned both the front and rear bumpers have been painted. They display well. The gaps look good. The color match is a 7 out of 10. the headlights appear to be original, and do show the typical cloudiness. there are a couple of small dents in the body, and evidence of paintless dent repair. I have these documented in the google album. With all of that said the car shows very well. There is absolutely no rust or corrosion. The bottom tub shows fantastic as does the belly pan. Chassis: Excellent condition. The brakes pads have about 60% left. The tires are mismatched. The front are Michelin Pilots. Although they have plenty of tread remaining they are older. The rears are Continentals and have about 70% tread remaining. I have cleaned up the bottom to show how nice it is. It did appear to have an oil leak around the rear main. Now that its cleaned I am not seeing it drip yet, but it will. The wheels do have curb rash. They do not wobble or shake. Interior: The Graphite Grey interior shows very nice. The leather had been marked on the drivers bolster so I did dye the side drivers bolster as well as the steering wheel. The die has been on a while and it remains very nice. I used a better level of dye that is clear coated. It has solid longevity. There is a small separation in the stitching on the passenger seat. The console has some wear documented in the pictures. The audio system is aftermarket Alpine and it works well. The top has no holes in it, but there are rub marks on the back that in time could become holes. Motor: Runs well, and the transmission shifts properly. I have some service records. Showing the water pump replacement as well as other minor items over its life. The steering was also rebuilt in 2017. There are also notes on the carfax of annual maintenance. I can not tell if the IMS bearing has been completed. The motor and transmission do not appear to have ever been out of the car. I would assume it has not been. My understanding is the failure rate is very low especially on automatics. I would not hesitate to drive my Porsche across the country. Well, maybe a set of front tires would be a good idea. I have priced my Porsche to sell. I am not trying to see the value I want to find a new owner. Please call me to ask any questions, make an appointment to see it, and of coarse make an offer. Please call me to discuss my 911 or arrange an inspection. My auction almost always end early due to a sale. I am happy to discuss a purchase price with any one who calls. You can reach me at 602-908-9267. 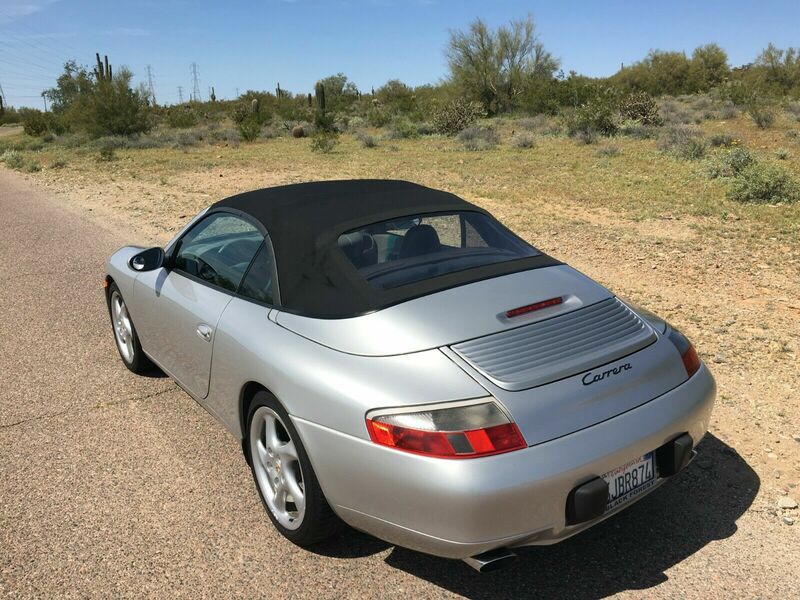 This particular 911 Carrera 2 Cabriolet was nicely upgraded from stock with 18″ Turbo-look wheels at about $1,100, the power seat package a further $1,500 and a few other trim items. 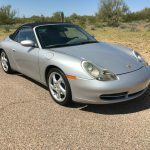 The Tiptronic transmission was a $3,400 option which does rob some sport, but is in keeping with the character of the top-down high-class motoring the Cabriolet was intended for. The Arctic Silver Metallic over Graphite Gray leather is an understated combination that works well in the classic 911 way. Mileage is in check at 67,000, and general condition shown, including underbody shots, appears to be very good throughout. Of course, it’s not possible to talk about these 911s without discussing the IMS debacle. Like most cars, the M96 has its faults and certainly the potential of engine implosion sounds ominous. However, there are engineered solutions to the IMS problem, and as noted by the seller, my research has found that early cars and Tiptronic models seem to be generally less affected by the IMS failures. ’99s had the dual-row IMS, so the ones to be careful of are really the later single-row 2000-2005s. 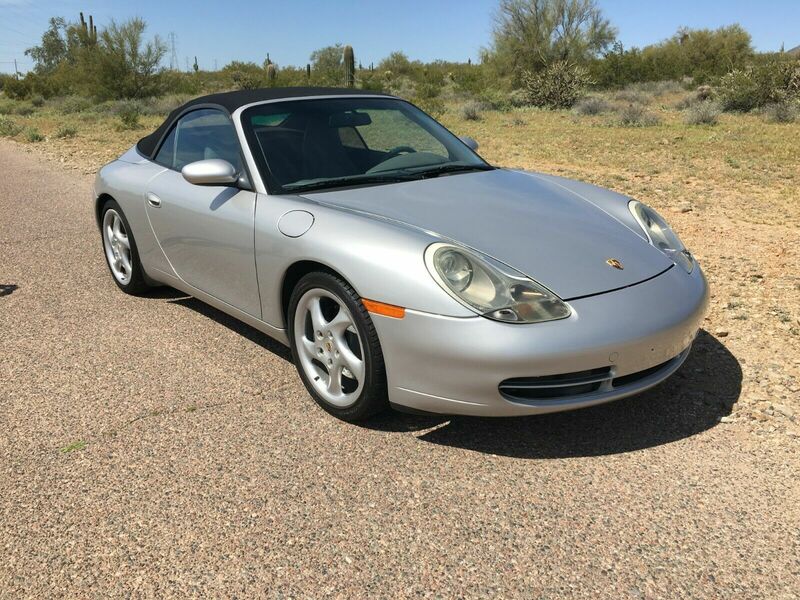 The replacement on a Tiptronic model is more expensive, but going rates seem to be 10-14 hours for replacement plus the cost of the parts; budget $2,500 -$3,000 if you want to go crazy. Is it a lot of money for a single repair on a used car? Absolutely. 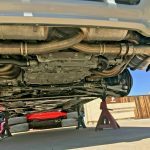 Did I spend the same amount on my wife’s Subaru Outback when the headgaskets failed? Yes, I did – and that was a car that didn’t have 300 horsepower or a convertible top. The point is, no matter what classic you get into that we feature, it will likely have the potential of some expensive catastrophic failure. If you want a Porsche with a 911 badge, this is still your most affordable – and perhaps arguably your best – option. These cars are great drivers, robustly built, will make you feel very special and won’t break the bank. The seller has included an extensive photo gallery as well. 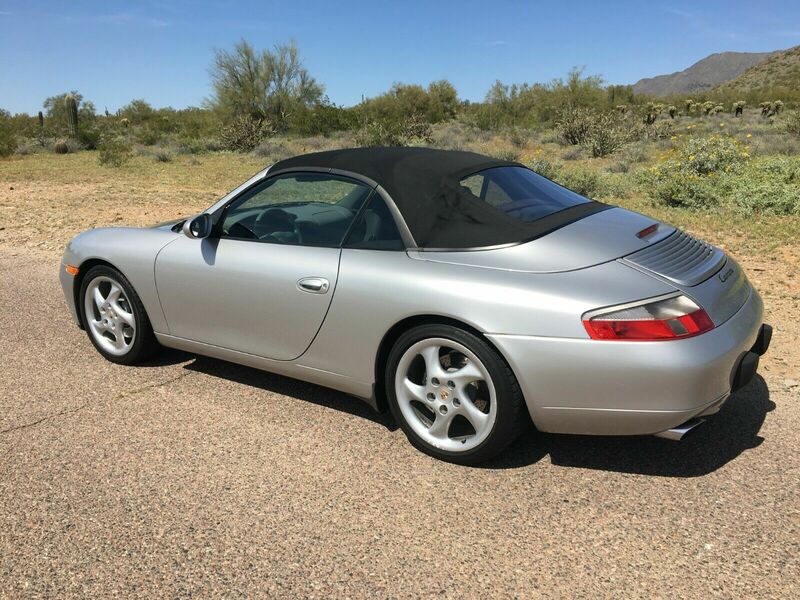 If you love drop-top motoring and the appeal of the 911, this car is worth consideration. Tagged 3.4, 911, Arctic Silver Metallic, C2, Carrera 2, Carrera 2 Cabriolet, Convertible, flat 6, M96, Porsche, Turbo Look, Turbo Twists. 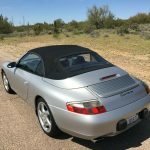 The 996 has found a bottom and some of the models have seen a pop in prices although they’re still far and away the cheapest way to get into a decent 911. The 996TT has seen a decent appreciation in price the last two years and the really good bargains are long gone. 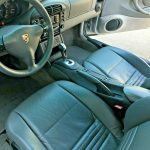 In terms of the pecking order for 911’s the 996 C2 Cab Tiptronic like this one is about the lowest rung on the ladder in terms of desirability, especially with the ding on the carfax that this one has. The 99 is better than the 00 and the 01 given the IMS issues with the other two. The 02, 03 and 04 still had IMS issues but the other improvements make them better choices. 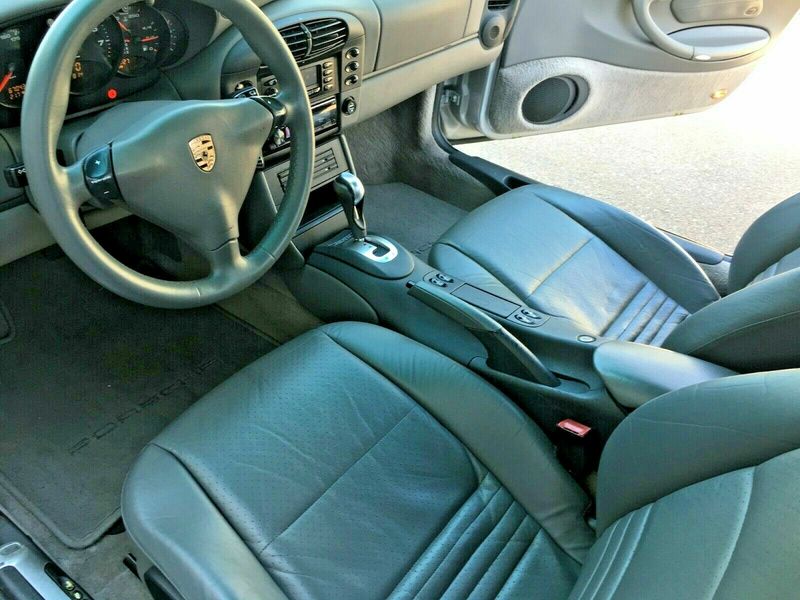 If you’re looking for a nice 996 cab there loads better choices for a fraction more than this one should sell for.